Comment: A dream! So mature for its young age. Hi, I'm Michio from Germany (originally Japan). I'm no expert and these tasting notes are primarily for my own enjoyment. 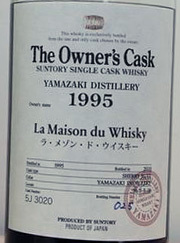 But since tasting notes of Japanese whiskies are a bit sparse on the net I thought I'd share them. That's all. Background picture by kanegen. Travel theme. Powered by Blogger.